Barbara A. 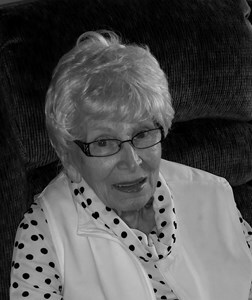 (Richard) Thiele, 90, of Topeka, passed away peacefully with family at her side on Sunday, January 20, 2019. She was born November 23, 1928, in Wichita, the daughter of Glenn and Lorita (Morawetz) Richard. She was a graduate of Lawrence High School. She attended Ward-Belmont Jr. College and then the University of Kansas. At Ward-Belmont Jr. College she was honored as a Phi Theta Kappa member and at KU, was a member of Delta Phi Delta, an honorary fine arts scholastic fraternity. Barbara later discovered that her husband’s mother was one of the fraternity's founders. At KU she was a member of Gamma Phi Beta sorority. Barbara had several careers during her life. The first was as an Occupational Therapist at Topeka State Hospital in 1950 to 1952. While there she became friends with another Occupational Therapist, Mrs. Phyllis Dole. 1952 to 1962 were devoted to raising her 3 children. As a young mother, Barbara was a volunteer at a playground for retarded children. Talking with the parents, she learned they were worried because all the support and programs were for children, and there were none for young adults. With her occupational therapy background she was ready when TARC (Topeka Association for Retarded Children) called asking if she could start a program for young adults. Barbara was the Workshop Director, Public Relations Officer, and one of two Instructors, (both trained in occupational therapy). The group of 10 had actual ages of 18 to 30, with developmental ages of 5 to 8 years old. Starting in March 1962, students learned skills and different types of work were undertaken; items were counted out, envelopes stuffed, jigs were made and grade stakes cut on a band saw for a local lumber company, and round concrete stepping stones were cast. Eventually they made sisal baskets for florists, and this was a great and ongoing success. By the fall of 1963 the workshop was open 4 days per week, two at a TARC training center and 2 at the First Congregational Church. The workshop’s proven success led to a federal grant in early 1964, leading to the rental of a small building as the program’s workshop. This allowed the program to expand and grow. In 1969 Barbara was asked by Phyllis Dole, wife of Senator Bob Dole, to provide sisal basket centerpieces for and to attend the Congressional Club in Washington, DC, breakfast to honor First Lady Pat Nixon. Each table had a sisal basket carefully crafted in Topeka at The Workshop with apples to match the theme "An apple for the teacher, Pat.” This exposure led to orders for baskets from throughout the country. In 1970 the TARC Community Center was completed, and the workshop moved to a building designed for the adult program. Ever interested in learning, Barbara became familiar with the work of Maria Montessori in the early 1970’s. She elected to continue her love of young children with Montessori training. This led to many trips to Kansas City for classroom training to become a certified teacher in the Montessori Method Preschool Education in the spring of 1973. In 1975 she founded Discovery School along with Jan Schiesser. This was a Montessori preschool structured for both “handicapped” and “normal” children. It was the first in Topeka having allotted space and time for working with handicapped children. She remained as the director and taught until she retired in 1984. Discovery School is still active at the same location. She was an active member of the First Congregational Church since 1952. Barbara held many volunteer positions. For many years she was an active member of PEO. Barbara enjoyed worldwide travel, visual arts, including painting and calligraphy. She was a lifelong learner with multiple interests. She was interested in learning about American circuses through her husband's lifelong interest in them. They were both avid KU basketball fans. Most of all, she delighted in engaging with and teaching young children. Barbara met John Thiele at KU in 1947, beginning their lifelong love affair. They married during an ice storm and blizzard on January 24, 1949 at the KU Danforth Chapel. He preceded her in death on February 4, 2018. Survivors include: Three children; Sara (Michael) Heydari, Lawrence; Jeffrey (Linda) Thiele, Columbia, MO; and James (Barbara) Thiele, Hillsboro, OR. Sara has 3 children, David (Stacie) Doeren, Dustin Doeren, and Graham (Chalinee) Doeren. David and Stacie have three children, Aaron, Addison and Aubrey (deceased). Sara has two stepchildren, Patrick (Ana) Heydari and Nicole Heydari. Patrick and Ana have two children, Camilla and Mia. Jeffrey and Linda have 3 children, Jeremy (Amanda) Thiele, Matthew (Jessica) Thiele, and Allison Thiele. Jeremy and Amanda have one child, Jasper and are expecting. Matthew and Jessica have two children, Alexander and Laura. James has two stepchildren, Erica (Ira) Crisp and Tracy Wood. Erica and Ira have three children, Allison, Cameron and Karsten. Tracy has two children Thomas and Tyler. She was preceded in death by her parents, a great-granddaughter (Aubrey Doeren) and a half-sister, Edith Lowrance. The family will greet friends Saturday, February 2nd, 2019 from 12:00 p.m. to 3:00 p.m. at Brewster Place Chapel, 1205 SW 29th St, Topeka, KS, 66611. A Memorial Service will be at 2:00 p.m., Sunday, February 3, 2019 at the First Congregational Church, 1701 SW Collins, Topeka. Private family burial will take place at Oak Hill Cemetery, Lawrence, KS. Memorial contributions may be made to First Congregational Church, 1701 SW Collins, Topeka, KS, 66604, or to Endangered Ark Foundation, PO Box 306, Hugo, OK, 74743; PH 580-317-8470; info@endangeredarkfoundation.org. The endangered Ark Foundation is a registered non-profit organization. It was founded in 1993 in part as a retirement ranch for circus elephants. Penwell-Gabel Mid-Town Chapel in Topeka is assisting the family. To leave a special message for Barbara’s family online, please click the "Share Memories" button above. Add your memories to the guest book of Barbara Thiele. My prayers and thoughts are with the families of Barbara Thiele. neighbors again at the Assisted Living Unit from 2016 to 2019. If I can make it will see you the 2nd. Barbara was the essence of modesty while remaining modern, dedicated and avant-garde. We want to express our sympathy on the passing of Barbara. Words say very little at a time like this, but knowing family and friends are thinking of you maybe helps. We hope so. She was such a caring and wonderful lady. Full of so many wonderful ideas and pursued her ideas and accomplished those ideas. Plus she had such a pleasing way of working with adults and children. You all have been so blessed to have such wonderful parents, and family and friends feel so blessed knowing both your mom and dad. Barbara was a loving, wonderful influence for my family. She was a great help to me through Discovery School. As a first-time Mom, with no family in Kansas, Barbara often re-assured me that I was on the right track! Both of my children attended this Montessiri School.... and we all loved it. Dear family of Ms Barbara , I am so very sorry for your loss. It is my hope that you receive comfort that will help to ease your pain of grief. There is comfort to be found in knowing that there is a promise that God has given to Ms. Barbara . It is written in His Holy Word the Bible at Acts 24:15 and John 11:25. May those beautiful words provide solace to you hearts and minds. Sara and Family, so very sorry to hear about the passing of your beloved mom....sending loads of hugs, prayers and deepest sympathy....cherish all those beautiful memories and they will assist you during the difficult times..